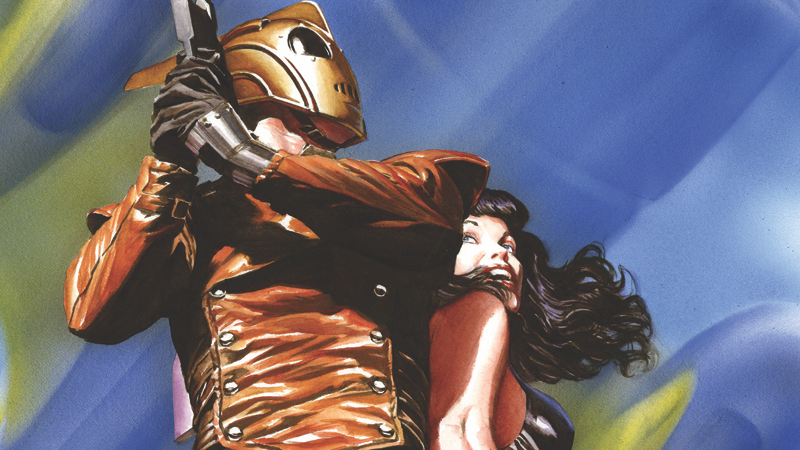 Dan Steven’s classic hero along with Betty Page, as depicted on the cover of The Rocketeer: High Flying Adventures anthology. A couple of years ago, we heard Disney was pulling together a script for a long-awaited cinematic return to its cult classic The Rocketeer, with an African-American woman in the titular role. But now the company has officially unveiled a separate reboot—except this one is a Disney Junior series. The Rocketeer will take more inspiration from Dave Stevens original comic book take on the character, but instead of the titular rocket-powered pulp hero secretly being stuntman Cliff Secord, the show’s Rocketeer will be a young girl named Kat, who receives a surprise Birthday present in the form of the Rocketeer’s jetpack, leading to her taking on the mantle herself and going on adventures with her best friend and her uncle. Each episode will contain two, 11-minute-long stories featuring Kat and her friends (one of them just happens to be handy with “gadgets”) as well as an original song. So if you’re expecting something in the vein of the Joe Johnston’s beloved 1991 film, this is probably going to be something very different indeed, especially since they’re aiming for an audience of two to 7-year-olds. Whether this is what ultimately became of the potential movie reboot or is a separate, albeit similar re-imagining to the movie we heard about back in 2016 remains to be seen. Nicole Dubuc will be executive producing Disney Junior’s take on The Rocketeer, set to hit screens in 2019.